A trip to Sovereign Hill wouldn’t be complete without the chance to try your hand at panning for gold. Down at Red Hill Gully Diggings you can watch a miner demonstrate how to pan for gold and then pick up a pan and try it for yourself! Immerse yourself in the fascinating history of Sovereign Hill and the city of Ballarat at the Gold Museum. You’ll find an impressive collection of gold nuggets and artefacts, learn about the incredible impact of the gold rushes on this provincial city during the 1850s, and even have the opportunity to purchase Australian-made gold jewellery (or a shiny gold nugget if you prefer) from the gift shop. 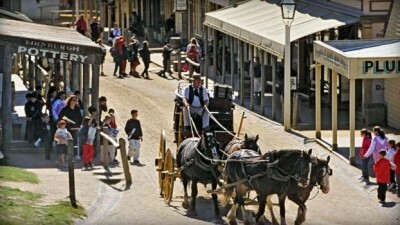 What better way to get around Sovereign Hill with kids in tow than by horse and coach. A coach ride around town and the diggings costs less than $AUD 20 for the whole family (2 adults and 4 children). The kids will certainly enjoy discovering how boiled lollies were traditionally hand made in the 1850’s at the Brown’s confectionery manufactory. From stripy peppermint humbugs to the iconic raspberry drops, there is something to suit everyone’s sweet tooth. The excitement and colour of the gold rush era is brought back to life by the many costumed characters you encounter throughout the recreated goldfields town, not only in the street but also inside the shops, hotel, theatre, schools, factories and of course down at the gold diggings. Discover all of this and much more on the Ballarat and Sovereign Hill Day Tour or hire a bus from Melbourne to explore the site at your own leisure. History, adventure, outdoor activities for the young and old, Sovereign Hill has it all!